ED - why was te facility to update contributions removed? Forum » Rugby » ED - why was te facility to update contributions removed? Iro contribution to fantasy competitions, I open and update threads giving the teams weekly before games are being played, It seems that it is not possible anymore, Why is that??? Please deal with this matter urgently. I have already started a thread on team selection iro Super Rugby - without an updating facility, it will be useless. I started a thread on the issue - but Sonny Bill destroyed it. It was what he did to such threads in the past. and fact is he is intent on causing havoc on the issue again. The member is not a member in good standing I believe - he is a front for another site member I am afraid, . There are advantages to not being able to edit a post. So people cant edit their comments to remove BS. Well I just want to go on record that when I said 'inapprpriate' I meant 'inappropriate'. I always write and then correct after I've posted. This will require a change. Hi Mike No idea what you are talking about. I’ve edited this post twice. Perhaps mail us a screenshot so that we can see what you are referring to. 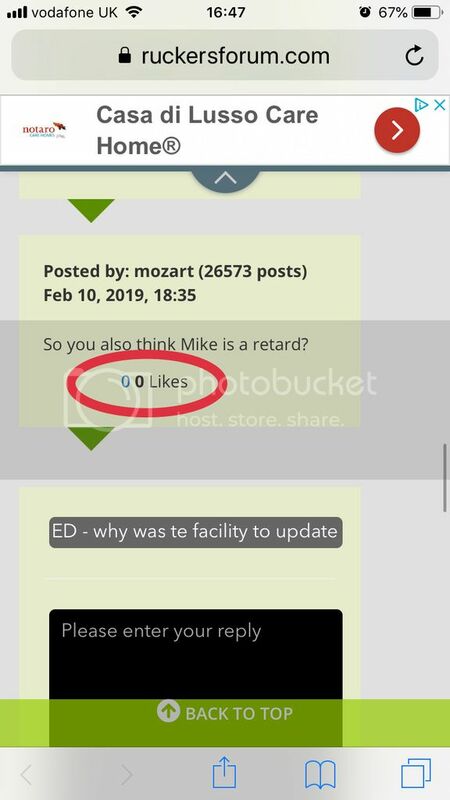 So you also think Mike is a retard? "Inspect element" and got a window dealing with lay-out used. Is there another way to handle the updating? Agree with SB and Ou Maaikie. I checked Safari and Chrome app on IOS as well we Chrome on Windows 10 laptop. Edit button gone on all of them. Thanks ceradyne That helps. We are seeing something different. We’ll take a look and will revert back. We updated our font library recently and as a result, some of our old icons were left out. All back to normal now. Wonder whether the real retard will apologize? Ou Maaik, you should know by now that while the real retard will get all red-faced and indignant when he thinks he's due an apology, he'll never admit when he screwed up and owes someone else an apology. That's how he rolls . . , and his Servile Gimps like Baboon-ou and Dense will squeal with delight and encourage him to continue his incredibly childish and pathetic beha viour. 'Hi Mike No idea what you are talking about. I’ve edited this post twice. And I then joked.....'So you also think Mike is a retard' . It had nothing to do with the editing, proven by my earlier post on the string saying I also couldn't edit. Stop being such a tedious old whiner.